You’ve heard of Ronaldo. You’ve heard of Messi. These players roll of the tongue of any football fan throughout the world cup. The way they easily glide past a defender as if he isn’t there, is a pleasure to watch. The World Cup so far has given us some exciting, high tempo and high scoring matches. However, the most refreshing thing to see is teams with less household footballer names pulling off some shock results. In this article I will reveal the Ronaldo’s, Pirlo’s and Neymar’s of the lesser exposed nations. Aged 30, Mexico’s Oribe Peralta has taken his electric form for Mexican champions Santos Laguno into the World Cup. Blessed with a natural instinct for scoring, Peralta’s known throughout the Mexican leagues for his aerial threat and his systematic left boot. Already scoring in Mexico’s first group game Peralta will be hoping to take Mexico to the last 16 and notch in a few more goals for El Tricolor. It would be easy for me to choose Chile’s Alexis Sanchez for Chile’s unsung hero. However, he is well known throughout European football for his exciting performances with Barcelona. Although Chile have a few rising stars in their hard working group, Arturo Vidal being just one of them. Vidal is an extremely versatile player, appearing at sweeper, right back, both wings and up front. Each position he plays he is very effective. Vidal is known for having a brilliant first touch and wonderful composure on the ball. 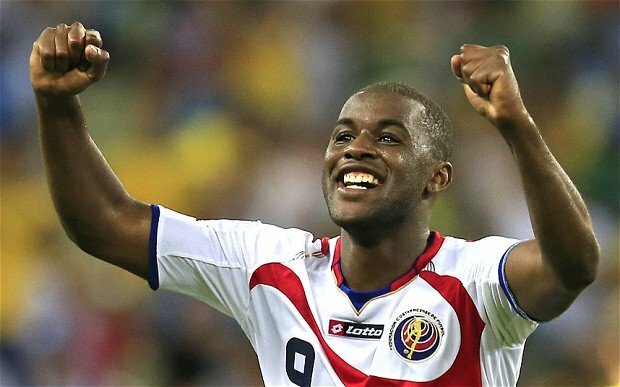 Arsenal fans will have been watching Costa Rica with delight, their right winger Joel Campbell has been a thorn in Uruguay and Italy’s defence so far in the competition. Although he is yet to make an Arsenal appearance, Campbell’s performances in World Cup will surely have Arsene Wenger keeping a closer eye on the forward. Campbell has been influential in Costa Rica’s eye opening performances showing power when driving forward and willing to track back to help a very hard working Costa Rican team reach its success. Seemingly one of the only attacking threats in an average Swiss squad. Shaqiri is always looking to beat a player and has a brilliant work ethic as well. He can sometimes be caught trying to take it past to many players. Still just 22, he will learn to make better decisions, with players like Ribery and Robben ahead of him. However, the potential is there for Switzerland to have a top worldwide player. Although he is only 5 foot 6 he is a very fiery player with great strength on the ball.